My NHS e-mail regularly receives invites to the Royal College of Psychiatrists International Congress. It is a congress that I have never attended as I remain concerned that we still do not have full public transparency in relation to potential financial competing interests of speakers involved. This week’s invitation to the International Congress offers the opportunity to “delve into the brilliant minds” of some of the keynote speakers. It is my view that inside us all, each and everyone of us has a brilliant mind. That brilliance is based upon our subjectivity as much as our objectivity. I have argued before why I agree with Dr Allan Beveridge that it is time for my profession to abandon the so-called “subjective-objective divide”. This divide is not helpful and often results in artificially separating us from one another. It seems to me that we have witnessed this phenomenon following the recent publication of the Lancet meta-analysis on antidepressants. I am of the view that most intentions are good. We do indeed need to recognise the brilliant minds of our experts, just as we should the experts of the subjective: those being us all. This is why we need to genuinely and carefully listen to experience and never to diminish it. With antidepressants, it is the case that we still do not have evidence to “validate” long term treatment. I do not agree with Dr Perlis that it is either a “fallacy” or “conspiracy” to make this conclusion. Whether as scientists, academics, doctors or people who have benefited or been harmed by medications, we should all try our best to use language carefully. 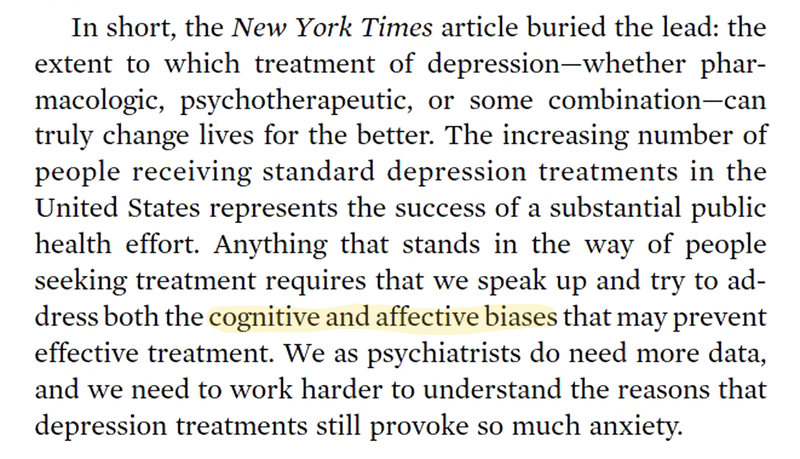 Dr Perlis talks of “speaking up to try and address both the cognitive and affective biases that may prevent effective treatment“. Once again this implies that the expert is free of bias (“objective”) and anyone who describes an experience which fails to concord with the expert view is automatically of less value (“subjective”). As a doctor, scientist and expert in my subjectivity, I have always taken the approach that any intervention (of any sort, not just medications) has the potential for benefits and harms. Evidence that is limited to data informs practice, but in itself is insufficient. There are several reasons for this, one being that subjective experience cannot be fully translated into words, let alone numbers. Another being that no search for evidence can ever be complete. There must always be freedom to speak, to ask questions of science, to embrace philosophy and critical perspectives that include the subjective. We should all try to be kinder to one another even if our views may differ. Let us then delve into our brilliant minds and restore to science the subjective perspective.